MooreReppion.com Blog: Fake Autographs On V Posters...again!! 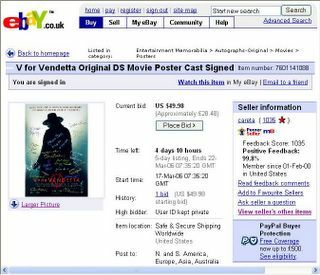 A genuine, movie poster of "V FOR VENDETTA" signed by Natalie Portman, Hugo Weaving, Stephen Rea, John Hurt, Sinéad Cusack, Stephen Fry, Rupert Graves, Roger Allam, Tim Pigott-Smith, John Standing, set decorator Peter Walpole, production designer Owen Paterson, writer Alan Moore, illustrator David Lloyd, the screenwriting team of Andy Wachowski & Larry Wachowski, producer Joel Silver, and director James Teigue. These are actual, handwritten, AUTHENTIC signatures obtained in person at Saks Fifth Avenue's Unforgettable Evening Benefit for the Entertainment Industry Foundation Women's Cancer Research Fundraiser held at the Regent Beverly Wilshire Hotel in Beverly Hills, California, and at other venues which are intentionally omitted here for security reasons. So there was Alan, in California (without having held a valid passport since the 1980's) having a right good laugh with Joel Silver and the Wachowski's. Yeah right. would of been funny to get hold of the poster to see if the signatures were any good, if ye look at their other items for sale, they all seem to be "signed posters". i suppose it is a business plan of sorts.